Achievement Bands™ are Ironwear’s™ new invention for the wearable demonstration of achievement. Achievement Bands™ are worn on the wrist and include a colored stripe system for the identification of the level and area of a student’s or master’s achievement. Achievement Band’s™ unique patented wristband achievement system is similar to the belt system used in Martial Arts to show the level of achievement. The Achievement Band™ has six sets of snap posts onto which up to six striped can be attached. The stripes come in different colors and represent different levels. Achievement Bands™ allow students to achieve one color stripe at a time as they improve and demonstrate their abilities. The colors are organized in the same basic way as Martial Arts belts: yellow, orange, green, purple, brown and then black. For example, the student starts with one yellow stripe and after they have earned all six yellow stripes they advance to the next color level and start with one orange stripe. Achievement Band’s™ stripes are made of rubber and snap over the soft integrated snap posts. Achievement Band’s™ patented stripe system works in the same way and includes a soft integrated snap post system that makes it easy to take on and off. Snap posts and holes allow the band to adjust to fit almost any wrist size. The bands can also be cut down easily with scissors to fit even the smallest wrist. 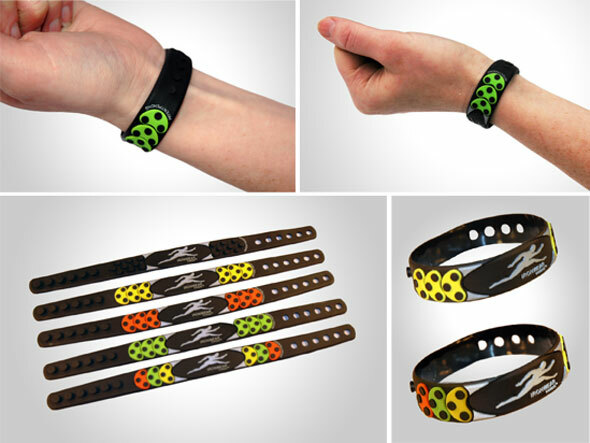 Achievement Bands™ are safer and more comfortable than silicone bands. They are ultra thin and flexible and are designed to not interfere with your movements. Unlike watchbands the Achievement Band’s™ are made of durable soft rubber and can release without breaking if they are pulled hard. Achievement Band’s™ colors are solid rubber and will not wear off like painted or printed wristbands. The band is solid metallic silver with a black oval surrounding Ironwear’s™ leaping man logo. Achievement Band’s™ are a great tool for motivating students. Achievement Band’s™ enable Students and Masters to show their level of mastery.